Inspiring Australia, Thinkable.org and Refraction Media have joined forces to create Research and industry: a relationship guide, a two-part series of videos from the Commercialising Research event held in October as part of the 2017 Spark Festival. Researchers and scientists explore what it would take to create more value from publicly funded knowledge and what they think needs to change in universities to better prepare researchers for the future. The 2017 Global Innovation Index ranks Australia 23rd in the world, behind China, New Zealand, Hong Kong and Singapore. While Australia is placed 10th in terms of “knowledge workers” it scores a low 52nd for innovation linkages and 48th for knowledge absorption. This is despite our ranking in the top 10 worldwide for innovation input – infrastructure, human capital, market sophistication and education. So what’s not working in our research-business relationships and how can we fix it? Research and industry: a relationship guide provides some clues. Businesses are increasingly looking to universities and research institutes for new knowledge that can help them scale up and innovate their products and services, but cultural differences and misunderstandings can get in the way. 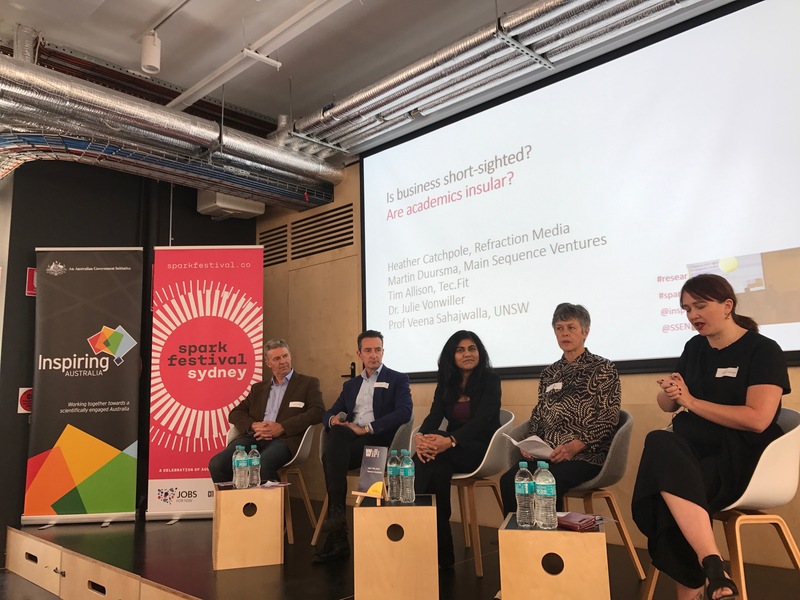 Our Spark Festival research event participants told us that a common mistake that academics make is to regard businesses as a source of funding rather than allowing a shared vision to emerge that may form the basis of a collaborative partnership. Responding to industry needs within commercial timeframes and complex IP constraints were identified as other common sources of tension. How academics can move more freely between the academic and commercial worlds. All Spark Festival panel members recommend STEM researchers move beyond their peer networks in order to find new opportunities. Networking, knocking on doors and telling others about research discoveries is key to successful colaboration. Public engagement in this sense is not just a hobby – it often leads to commercial opportunities and interesting partnerships. Academics should therefore be both encouraged and rewarded for talking publicly about their work. There are many opportunities for scientists to meet people from other industries in order to broaden the scope of their research and develop potential partnerships. Image by David Vagg Photography. Read more at the Research Futures channel co-produced by Inspiring Australia (NSW) and Refraction Media with support from Thinkable.org.